What Would an Apple E-Cig Look Like? Since vaping first became an option it has evolved in big ways; vape liquid can be found online and in stores, vaping devices are improving and there are new and different ways to vape being discovered. Not to mention, vaping is becoming more and more popular as smokers switch from standard cigarettes to e-cigarettes. So, it’s never too surprising when a new vape technology hits the market or a better e-cigarette is invented. It’s a growing market and companies of all sizes are looking to get involved. It was recently reported that smartphone and technology company Apple had submitted a patent application detailing a new form of vaporizer technology, which surprised many. Not only does Apple usually stick to all things tech and communication, but it’s an unlikely move for them to support any form of technology associated with smoking. This got us thinking, what would an Apple e-cig look like? We know that Apple likes to stay ahead of competitors and the company has shocked consumers before with their advances in technology, meaning any potential Apple e-cigs are likely to impress. Here are some of the ideas we had for how an e-cigarette designed by Apple would look. An Apple e-cig would almost certainly connect to iPhones and iPads. All Apple products work well together and they integrate seamlessly. For example, anything that you do on your phone can be added to your MacBook automatically, so we’re sure an e-cigarette would do the same. Perhaps you’ll be able to order e-juice directly from your e-cigarette using Apple Pay? In regards to looks, an Apple e-cig would probably follow a similar design to other Apple products with the logo on the back, and a smooth and modern aesthetic. Would an Apple e-cig have some form of installed application? Apple love adding apps to their smartphones and tablets, so an e-cigarette could also have some sort of in built technology. Who knows, much like the Apple Watch an Apple e-cig could show messages and accept phone calls. An obvious but important question, would an Apple e-cigarette by called an iCig or iVape? The Apple Watch, FitBits and other health and fitness measuring devices can sync up to the Health App on the iPhone. One avenue Apple could explore is adding vaping technology to help those who are conscious of their health but are not ready to give up vaping to measure their nicotine intake. All of Apple’s other products are available in a range of colors and Apple fanatics take pride in having their smartphones, tablets and laptops match. Currently, Apple products are available in different black finishes, gold, white and rose gold. Would an Apple e-cig follow suit? Would an Apple e-cig be available in different sizes to accommodate different amounts of e-juice? The latest iPhone is available with different memory sizes and it would be interesting to see whether Apple explore the market of providing different e-cigarette sizes. What Do We Know For Sure About The Apple E-Cig? Well, first of all, we don’t know for sure that Apple are planning to make an e-cigarette and doing so would be a huge change of direction for a company that specializes in laptops, tablets and smartphones. However, Apple is always evolving and therefore it isn’t out of the question. 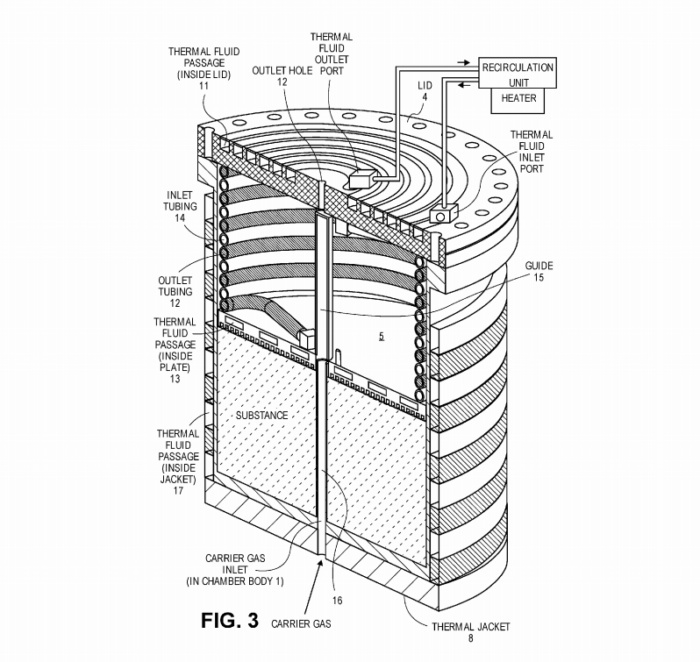 So, what we do know so far about this patent application? The US Patent and Trademark Office published Apple’s application outlining plans for a vaporizer device that can regulate temperature, release heat using some form of substance from within a canister and keep air out of the chamber where the substance is being vaporized. It would also be able to vape a liquid without losing much to cooling, which would be a huge step forward in vaping technology. However, there are some missing pieces of information and it’s currently unclear as to what Apple are planning to make. We don’t know who the device is for, what the device will do and what substance the device will use. This means there are a lot of different options and an e-cigarette may not be Apple’s plan at all. In fact, earlier this year Apple began to cut down on the number of vaping apps that were allowed in the App Store and so vaping may not be on the cards. So, whether or not an Apple e-cig will be on the market anytime soon is unclear and as of yet, there is very little information available about what Apple’s vaporizer technology will be used for and why they are in need of the patent. However, if they were to create an e-cig that was technologically more advanced than those currently available it is likely to be popular.